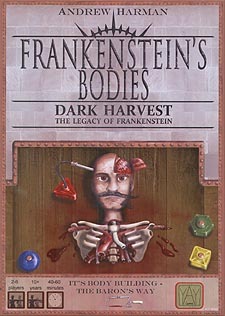 You are surgeons aiming to impress Baron Frankenstein with the two bodies you stitch together. You have one theatre, two benches and not enough parts to go around. Place body parts taken from the daily delivery, or steal them from other players by invasive surgery. But time your surgery wrong and the body part will be ravaged by infection. Bring in Master Surgeons to help avoid parts being stolen or infected. Mix and match parts all you want but remember - bodies that match gender and serum colour earn bonuses and help you win. Frankenstein's Bodies is a highly interactive game of grisly hand management, grabbing opportunity and stabbing opponents in the back. WARNING: May cause outbreaks of inappropriate humour and infectious chronic puns.